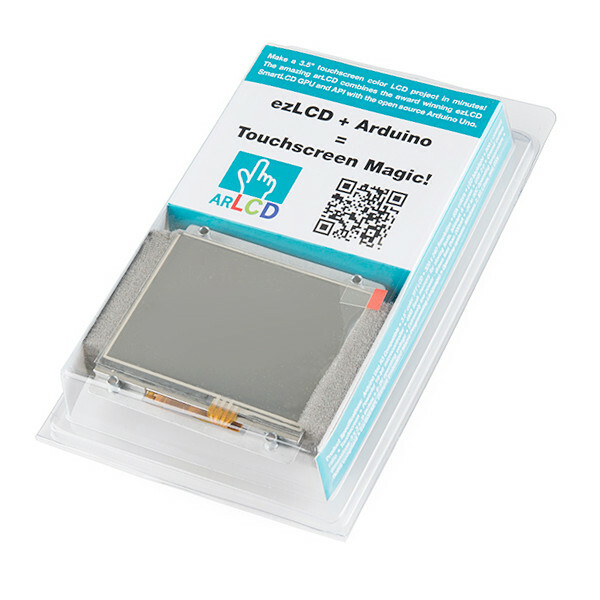 The arLCD Smart Touchscreen LCD combines the ease of use of an Arduino with the award winning ezLCD touchscreen technology. The arLCD is the ideal solution for your robot's advanced UI User Interface applications. It has a 3.5" full color touchscreen display with a powerful command set that makes building a UI fun and easy. This board includes a built-in Arduino Uno R3 compatible microcontroller. 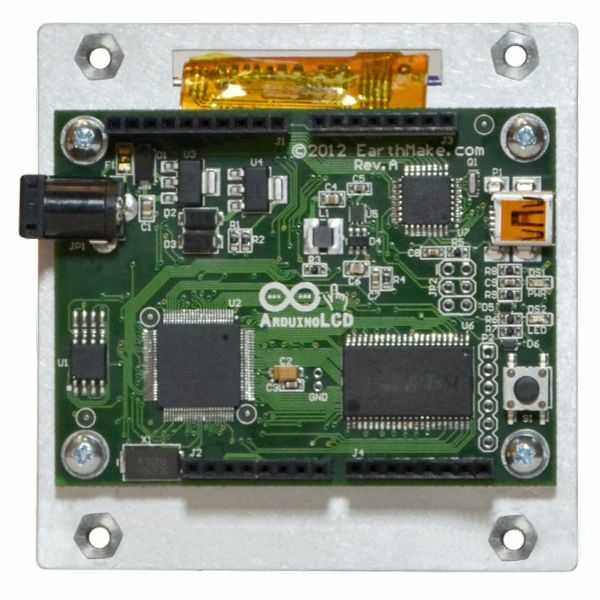 As a true Arduino At Heart, you can program this board with the Arduino IDE and attach a variety of shields for expanded capabilities. The Arduino compatible microcontroller talks to the ezLCD GPU Graphics Processing Unit using a high level command set to implement the UI. A serial line is used to link the Arduino compatible controller and the GPU. This design leaves most of the Arduino pins available for other purposes. The winning combination is ideal for building a standalone UI system that doesn't burden your big robot's main controller endless pixel management tasks. The ezLCD smart command set takes care of the pixel management for you and the added Arduino compatible microcontroller enables a truly smart UI that is worthy of your advanced robot projects. The built-in Arduino Uno R3 compatible microcontroller can even be used as the brain for your small robot or other touchpanel projects. The arLCD features an ezLCD module that contains an LCD, touchpad and dedicated GPU. 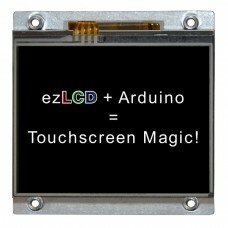 The ezLCD supports a rich command set that simplifies the creation of your UI. It's easy to draw text, shapes and colors. Create fully interactive visual control panels using the built in widget controls. Interactive widgets include standard UI components such as buttons, checkboxes, radio buttons, sliders and progress bars. Specialized widgets include analog meters, dials, readouts and virtual LED indicators. The embedded 16 bit GPU has a 2MB LCD frame buffer and 4MB of flash for storing custom fonts and bitmaps. The 3.5" TFT LCD supports 65K colors with a 320x240 resolution and an LED backlight. 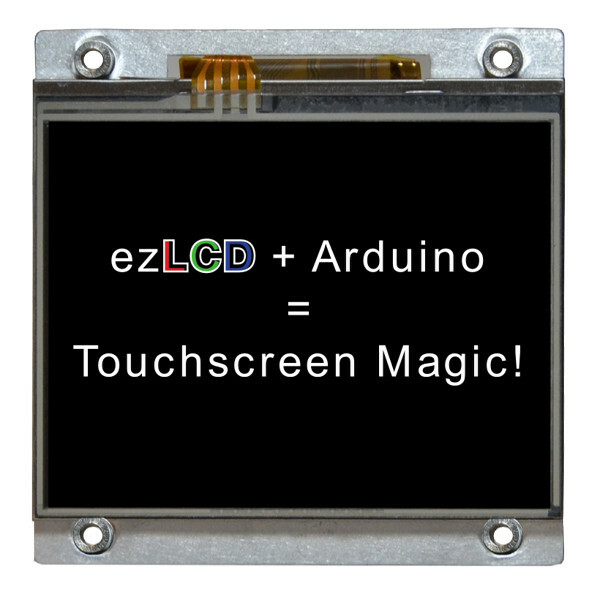 The ezLCD display and Arduino compatible microcontroller board are attached to a heavy duty metal bezel with mounting holes. This package includes a USB cable and plenty of demos to get you up and running quickly.